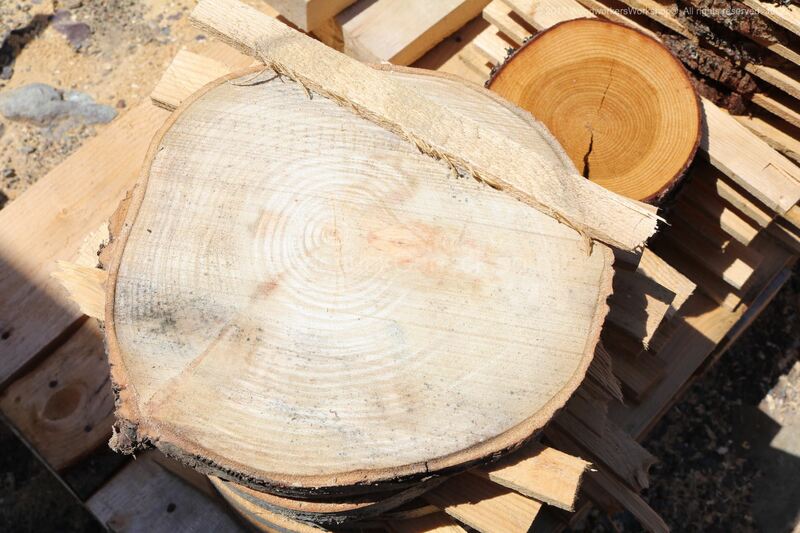 live edge sugar maple slabs. What I noticed most about milling sugar maple is that it smells like shampoo. 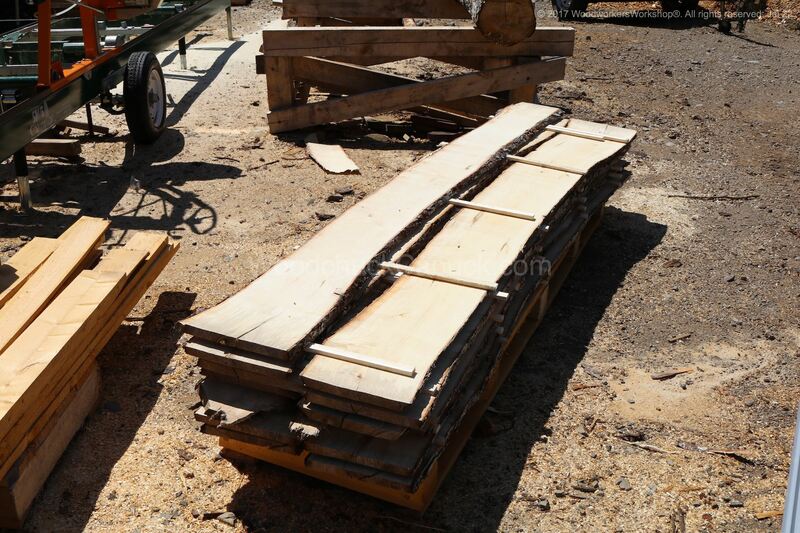 I realized after it was the dish liquid I out into the water tank of the saw mill. Duh! 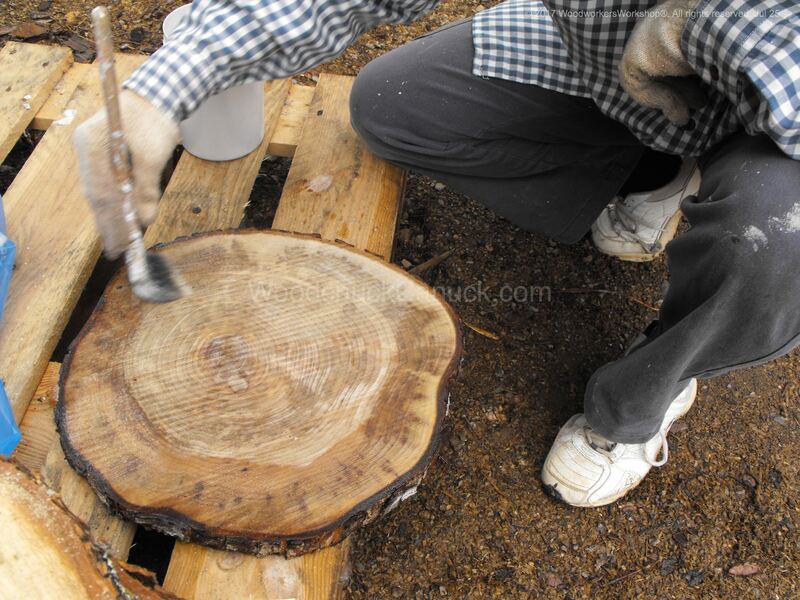 After that was slabbed, we put our attention to the larger trunk portions. 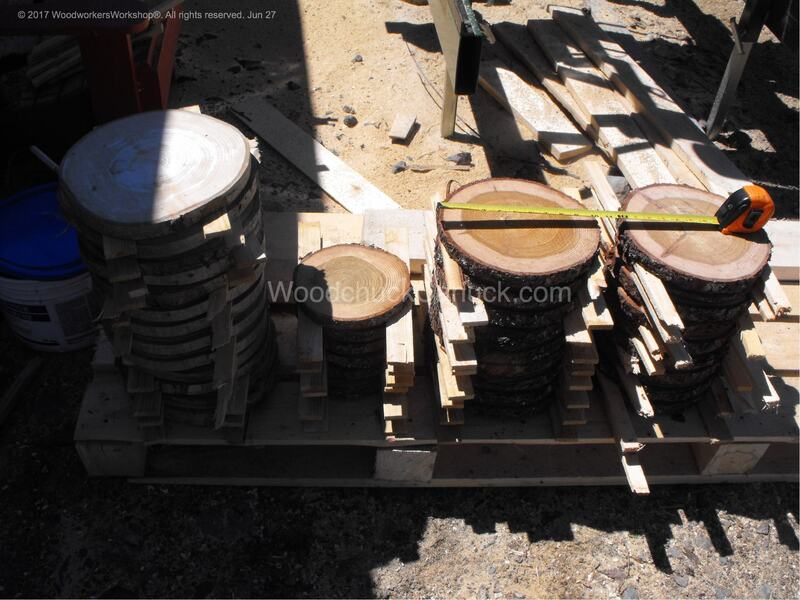 I had previously ordered some Pentacryl so I wanted to test it out by cutting up some wide cookie shaped wooden discs. On Jun 27 2017 I sliced up some poplar and tamarack for cookies. Stacked and stickered to let air dry with full exposure to the sun and weather. 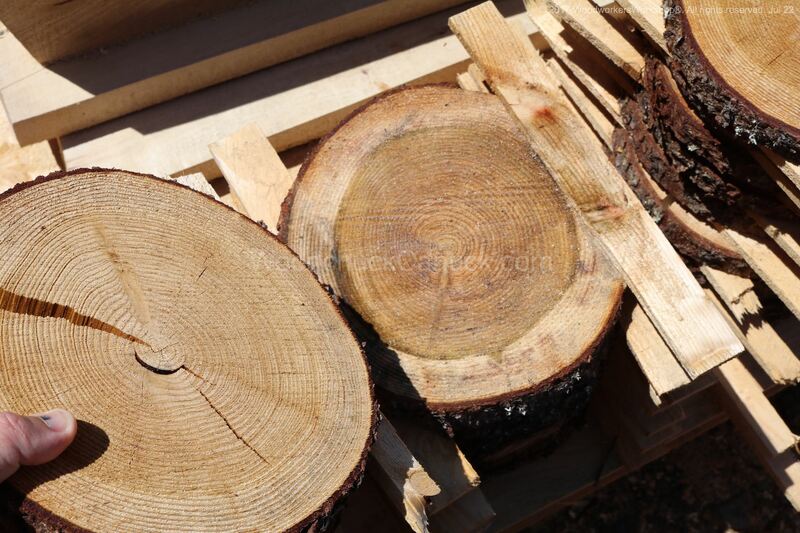 I wanted to see how the wood would react to naturally drying outdoors. Its now Jul 22 2017 and I am checking in on the cookies. Actually I’ve been looking at them all this time as they are parked right next to my mill. As you can see the top cookies are darkened from the sun and cracked. The poplar cookies, which I thought for sure would crack, have held up reasonably well. At least when compared to the tamarack, which seems to mostly have cracked and/or gone moldy. Which is strange considering all the dry weather we’ve had. Some folks will dry cookies in bags of sawdust over the course of a year or more. That’s another way to do it. I am doing this experiment simply to see how well this method works. The stuff Gina is applying to the both sides of the cookies is Pentacryl. Its suppose to prevent cracking. The instructions indicate multiple applications over the course of a week, keeping the cookies bagged. I’ve also cut a stack of 1 and 2 inch thick cookies, stacked and stickered to dry naturally, not bagged. I want to see how they compare. That white can is about a litre of Pentacryl. We used up a 1.5 L on the first coating. I am assuming successive applications will require less Pentacryl. A litre of Pentacryle costs nearly $25 (when bought in bulk). So with multiple applications to come, you can see why a treated cookie costs as much as they do. The cookies have been sitting in the bags now for a full day. 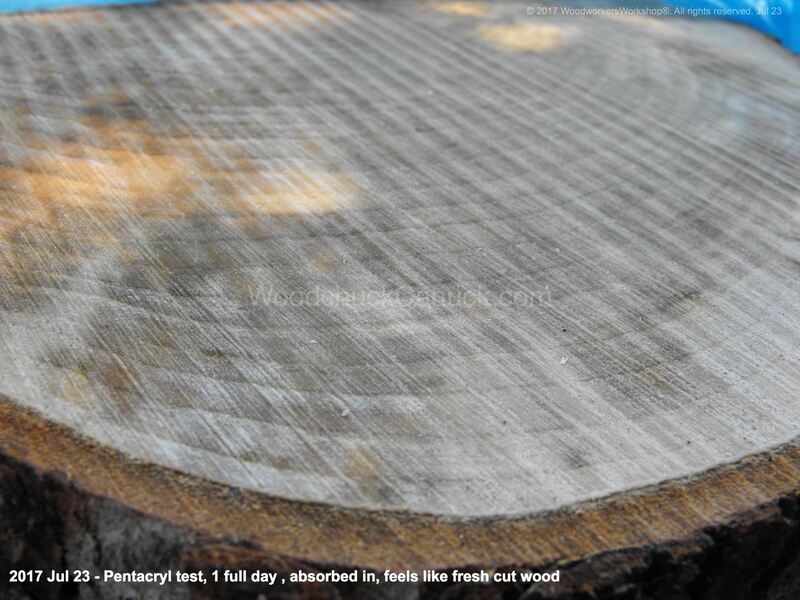 Its time to take a look and make the next application of Pentacryl. 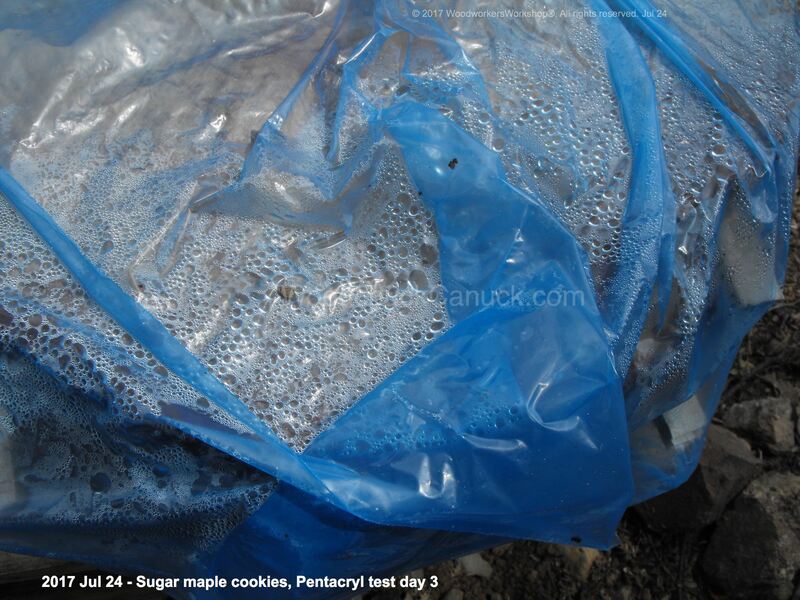 Pentacryl applied to cookies in bags. A closer look of the bags before opening them, you can see the amount of moisture that is coming from the wood. A closer look of the cookies and you can see the initial application of Pentacryl has been absorbed. Time to make thesecond application. 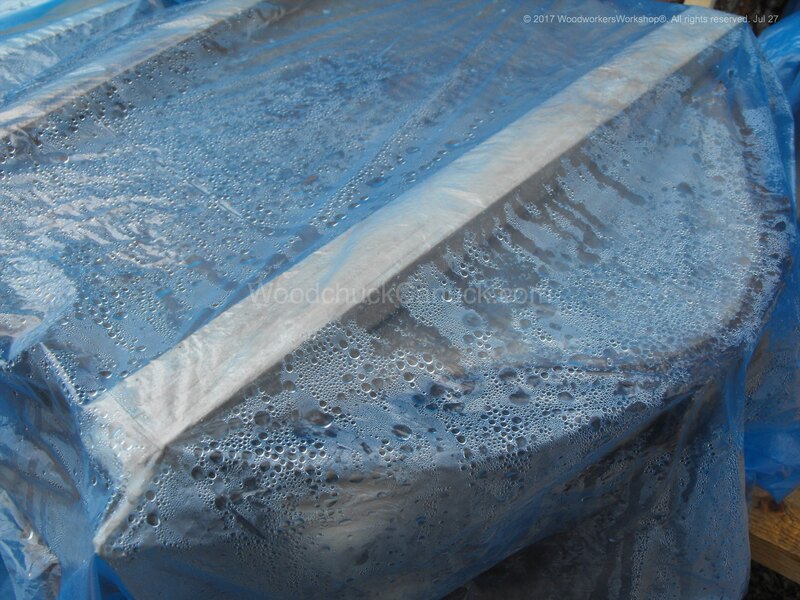 Its worthwhile to note that upon applying the second coat of Pentacryl, we used up approximately 1 litre of the product. 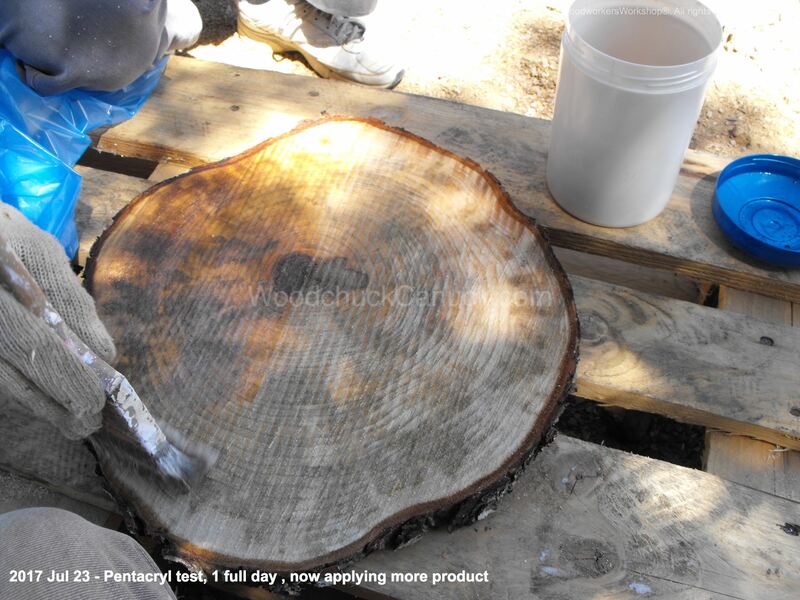 We are now on day 3 of our test of applying Pentacryl. Below you can see the photo of the moisture inside the bag. The results are similar to that of the first day. Moisture inside of bag after 2nd day. 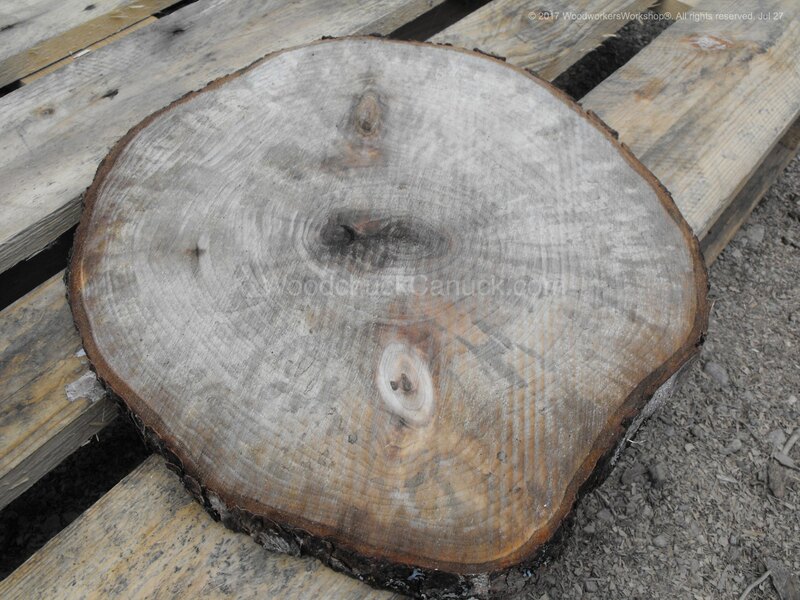 The feel of the wood surface seems a little bit dryer than the previous day. 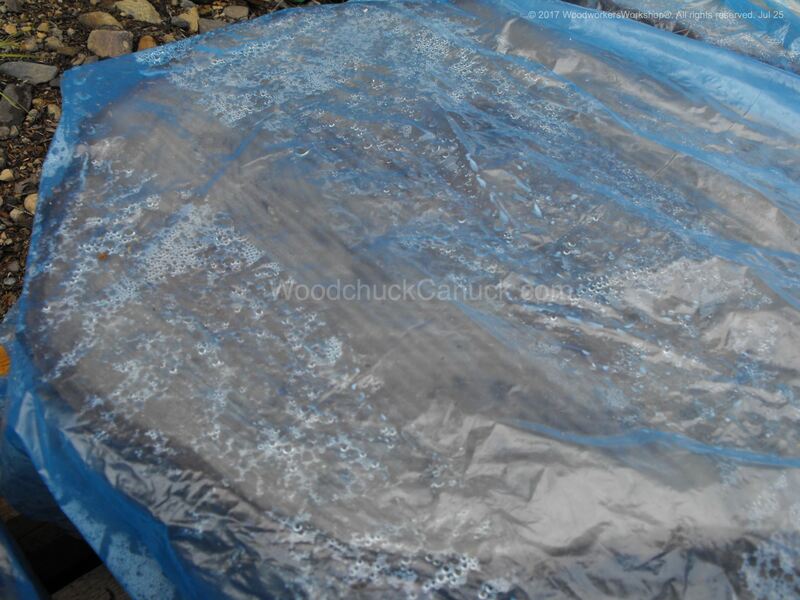 In total we have applied Pentacryl to 13 cookies on each side, using up a total of 3.6 L of the product. Day 5 is pretty much like day 4, only we used a full litre of Pentacryl. A little more than yesterday. Day 6 is again pretty much like day 5, we used a bit more than 3/4 litre of Pentacryl. One day left of application. Today is really not much different than the previous six days. 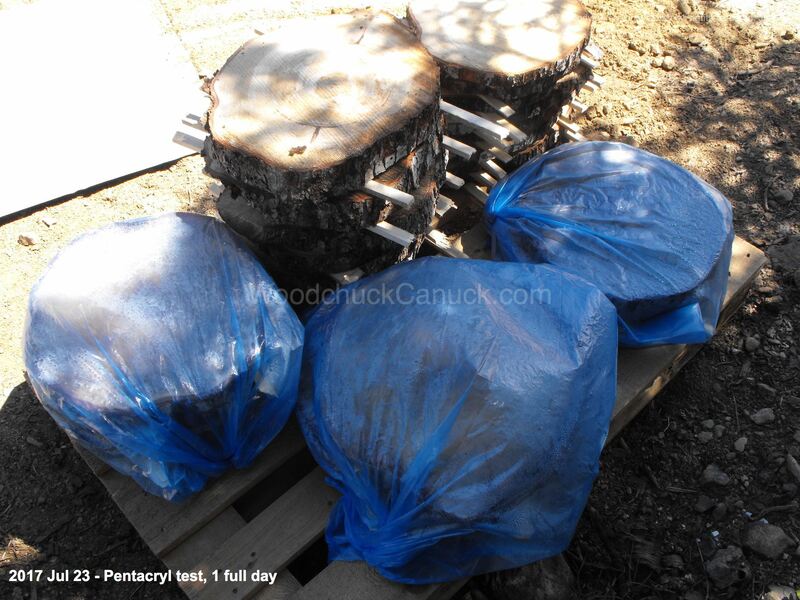 The bags containing the wood discs were wet on the inside. 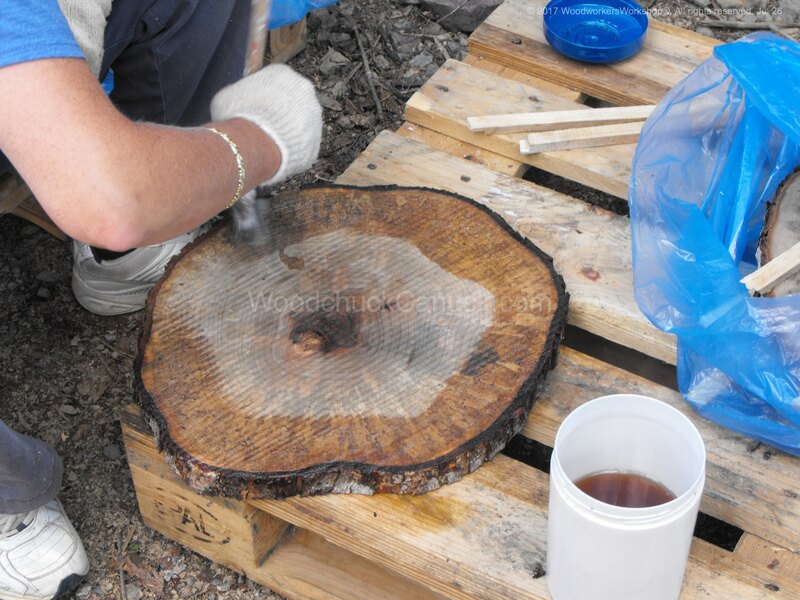 The surface of the wood discs were damp, with no Pentacryl remaining on the surface. Watch our video for a short discussion on results and overall cost analysis. Cookies are dry. Video below shows the results. 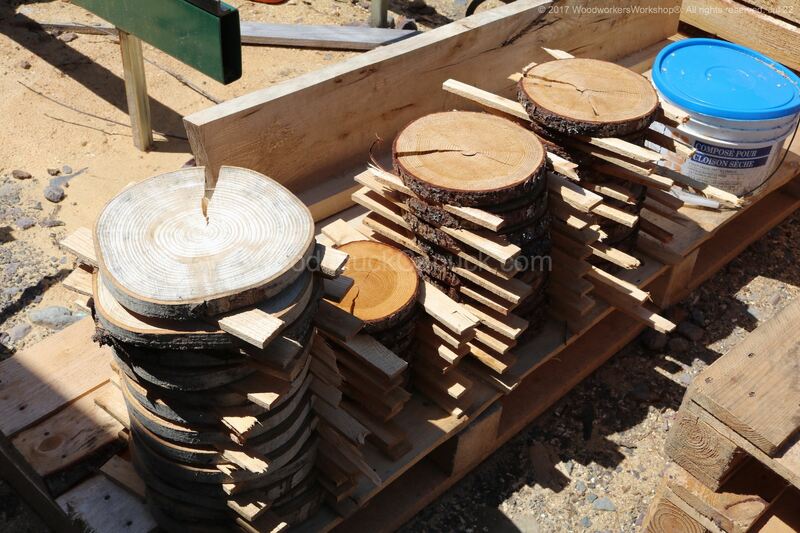 Now in the video I said that only the top half of the stack on the right were treated with Pentacryl. In fact, that entire stack was treated. Why the bottom half is not the same colour, I don’t know why. For us, the results of using Pentracryl are barely worth it for the expensive incurred in treating and drying them in storage.